MANILA, Philippines - The Department of Education (DepEd) has officially released the school calendar for school year (SY) 2015-2016. Based on DepEd Order No. 9, series of 2015, the opening of classes shall be on Monday, June 1, 2015 and the last day shall be on Friday, April 1, 2016. The next SY will consist of 201 school days, inclusive of the five-day In-Service Training (INSET) break. The parent-teacher conferences shall b held on the second or third Saturday after every quarterly examination. DepEd added that Christmas break shall begin on Saturday, December 19, 2015. Classes shall resume on Monday, January 4, 2016. Meanwhile, the summer classes shall begin on Monday, April 11, 2016 and end on Saturday, May 21, 2016 which is the last day for the final examination. In preparation for the opening of classes for SY 2016-2017, the schools shall conduct the following activities: early registration on Saturday, January 30, 2016 and Brigada Eskwela from May 16-21, 2016. 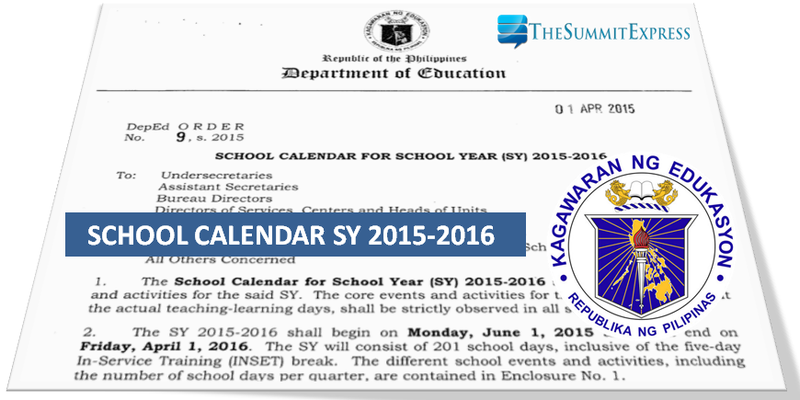 DepEd said that private schools may deviate from this School Calendar. However, they may not start classes earlier than the first Monday of June and not later than the last day of August, as provided in Republic Act (RA) No. 7797 entitled An Act to Lengthen the School Calendar from Two Hundred (200) Days to Not More Than Two Hundred Twenty (220) Class Days. They should notify the appropriate DepEd officials in advance regarding any deviation. Schools may observe national and local celebrations, holidays and advocacy activities other than declared by DepEd, provided that the total number of school days shall not be compromised. Make-up classes can therefore be conducted to compensate for the school days spent for activities deemed beneficial to the learning-teaching process. Likewise, make-up classes are recommended in lieu of no-school days due to occurrence of a natural and man-made calamities. A mechanism for having make-up classes must be agreed upon by school administrators and parents.